I was very fortunate to have been selected as an ICA Fellow at the 2015 ICA Meeting in San Juan, Puerto Rico. I was among wonderful and international company, including Lance Bennett, Noshir Contractor, Hans Mathias Kepplinger, Hak-­Soo Kim, Malcolm R. Parks, and Steven R. Wilson. 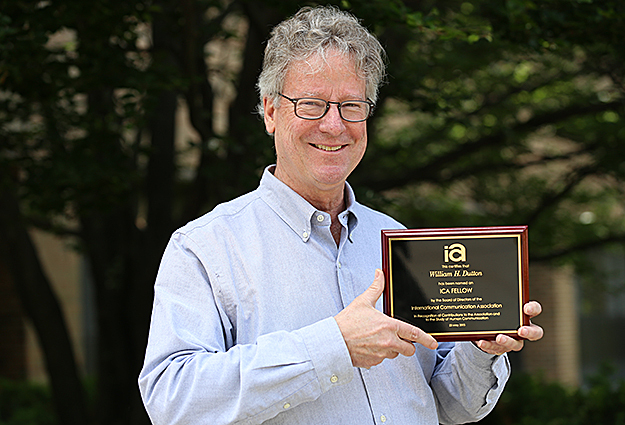 William Dutton, Quello Professor of Media and Information Policy in the College of Communication Arts and Sciences and Director of the Quello Center, recently was inducted into the prestigious group of International Communication Association (ICA) Fellows in recognition of his distinguished scholarly contributions to the field of communication. “William Dutton is the outstandingly successful founding Director of the Oxford Internet Institute, as well as an Oxford Don and currently channeling scholarly input into Washington in the area of telecommunications policy,” the ICA said in a statement. “He has been exceptionally productive and influential in a variety of areas concerning communication and information technologies and communication policy for nearly four decades. Dutton was the first Professor of Internet Studies at the University of Oxford, a position he held from 2002 to 2014, where he was Founding Director of the Oxford Internet Institute (OII) and a Professorial Fellow of Balliol College. He also is a Professor Emeritus at the Annenberg School at USC, where he was elected President of the University’s Faculty Senate. Dutton has received numerous grants for his research and is widely published. His research interests include a wide range of issues concerning the Internet and society, policy and regulation, such as initiatives around digital divides, the role of networked, distributed collaboration and digital social research, and politics and the Internet, including his influential conception of the Internet’s Fifth Estate. “His long and distinguished career in the areas of ICTs (information and communication technology) and policy is also distinguished by his early promotion of the socio-technical systems approach, public policy issues involving ICTs, the critical understanding of ‘wired cities,’ and the ‘ecology of games’ theory. Notably, he early on highlighted a more international perspective on ICT research and policy,” the ICA said in its statement. Dutton currently is the principal investigator of an MSU research team working on a Net Neutrality Impact Study. The goal of this research is to provide a non-partisan, unbiased assessment of the short-, medium- and long-term implications of the FCC’s new order approving rules that support net neutrality. He also is leading a Quello Center team focused on the use of the Internet for the social and economic revitalization of Detroit, and is a co-principal on an Oxford cybersecurity project. After 12 great years at Oxford, I am delighted to be joining MSU as their new Quello Professor. Not sure how my former USC Trojan colleagues will react to me joining the Spartans! The current Director of the Quello Center, Professor Steve Wildman, a recent Chief Economist at the FCC, posted a much appreciated announcement of the appointment. I’ll be joining MSU in August 2014 and look forward to staying in touch with you over this and related blogs in the future. One of my goals will be to put the Internet and Web into the center of a forward strategy for building the Quello Center’s role in the new digital world of communication research, policy and regulation. My work as a co-principal on the Global Cyber Security Capacity Centre will continue at MSU, as will my work on the Fifth Estate, partly through the support of a project on collaboration at the DTU (Danmarks Tekniske Universitet) as well as through support of the Quello Center. At MSU, I will hold the James H. Quello Chair of Media and Information Policy.